This is the most immersive 24/7 polar bear experience on the planet. Staying out on the tundra among the bears for 3-4 nights in a mobile hotel provides unparalleled opportunities for prolonged observation of these majestic creatures at close quarters as they patiently wait for the ice to freeze. Arrive in Winnipeg, once a fur-trading post and boomtown for the Canadian Pacific Railway, today Manitoba's cultural and commercial capital at the eastern edge of Canada's vast prairies. Transfer to the historic Fort Garry Hotel, grande dame of Winnipeg hospitality and one of the city's most prestigious landmarks. Meet your Expedition Leader at an orientation and welcome dinner this evening. Fly to Churchill and transfer to the Tundra Lodge by Polar Rover, watching for Arctic wildlife against the vast tundra backdrop along the way. 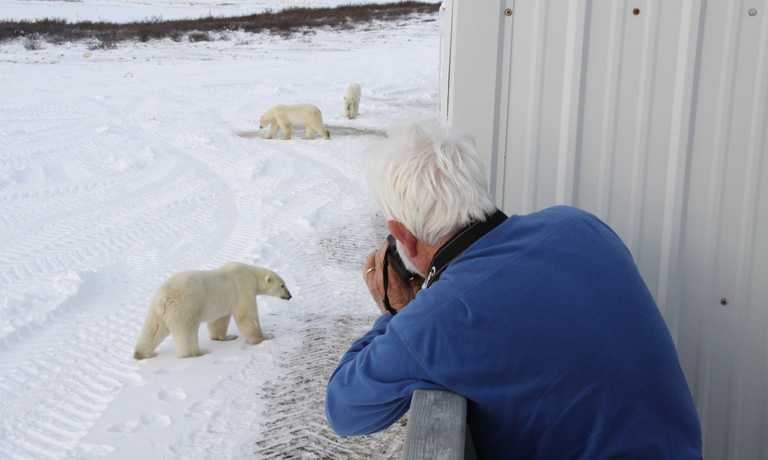 A presentation on polar bears by the Expedition Leader provides an enlightening introduction to your northern adventure. Dinner this evening is prepared by a professional chef, who resides at the lodge throughout the season. Don't be surprised, though, if the meal is interrupted by a mad dash to the windows to watch a polar bear lumbering across the snow around the lodge. 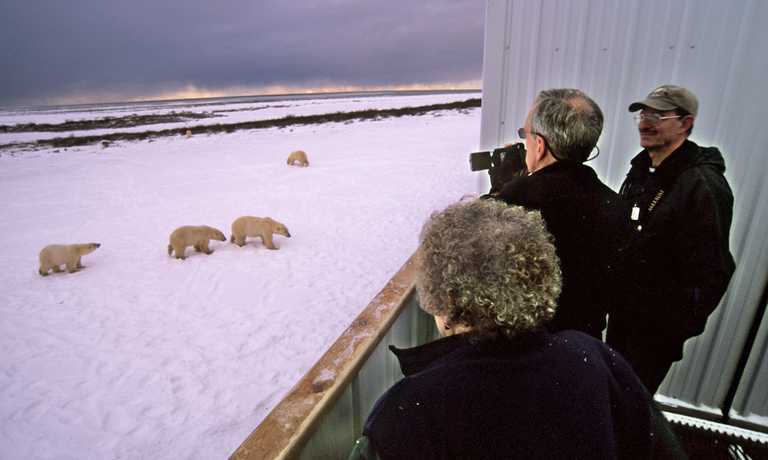 The Tundra Lodge is strategically positioned at the beginning of each season in a spot that attracts the greatest number of polar bears in the Churchill area. Inquisitive bears often approach the lodge, which features rows of windows and fenced observation decks to accommodate your own curiosity. You'll find Ursus maritimus even more majestic up close than you could have imagined. Yet these giant bears, the largest land carnivores in the world, are charming and whimsical, too, and it is a rare treasure to see them in their wild habitat. As you watch them interact, you'll be delighted by their antics and rugged beauty. 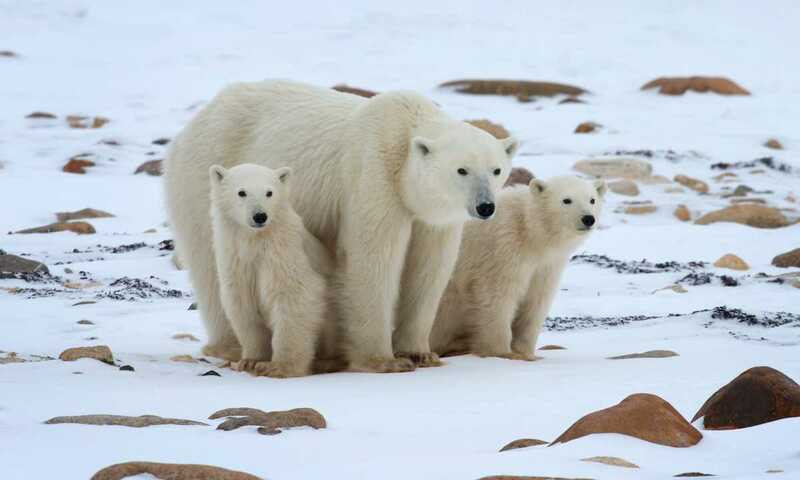 You may see mothers protecting and teaching their cubs, young males play-fighting, or massive adults patrolling the shore as they wait for the bay to freeze. 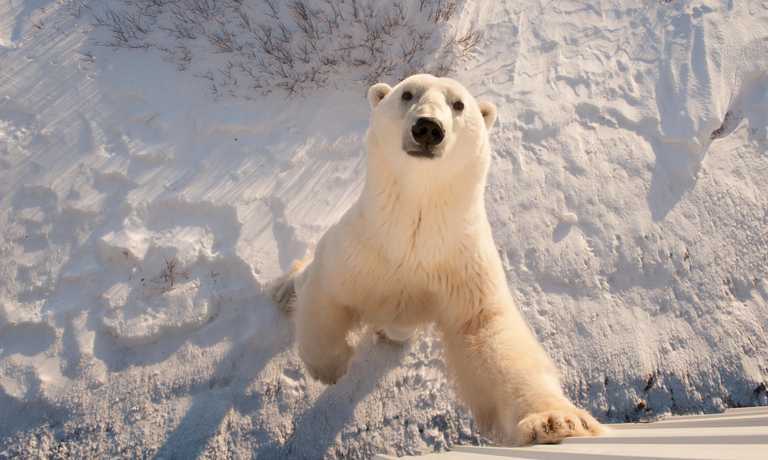 The unique location of the Tundra Lodge, combined with excursions in the special all-terrain tundra vehicles called Polar Rovers, affords lodge guests the best possible wildlife encounters in the region. The small spit of land where the lodge is located often attracts the greatest number of bears in the entire area. The guide and group may opt to take a full-day excursion together, or split time between a half-day trip and viewing bears from the lodge. In addition to polar bears, you may see caribou, Arctic fox, Arctic hare, ptarmigan and snowy owls. At the end of each exhilarating day, retire to the cozy accommodation for dinner and presentations. In the light cast by the lodge across the frozen tundra, look for the illuminated eyes of animals. And if you are fortunate to have a clear night, the Northland's spectacular natural light show may appear as darkness descends, Churchill has some of the world's most concentrated aurora borealis activity. This morning, board the Polar Rover, leaving the ice-bound coastline of Hudson Bay in the distance as you make your way back to Churchill. Depending on flight schedules, there may be time for some last-minute exploration of this subarctic frontier community, originally a Hudson Bay Company fur-trading post, with a chance to pick up local handicrafts and souvenirs or take part in an optional dog sled excursion or helicopter tour over the tundra. Enjoy a farewell lunch in Churchill before flying back to Winnipeg where you have a final reception before your adventure concludes. On the 6-day trip, return to Winnipeg on Day 5 with flights home scheduled for Day 6. Departure dates are confirmed approx. 10 months in advance. This means that they could move by a few days in either direction. To secure your place(s) we strongly recommend that you book ahead now, but that no concrete pre- and post- arrangements involving flights, hotels or other adjacent plans are booked until we confirm the exact dates.